FJO treatment has the unique potential to greatly influence health at any age. Few other forms of conservative, non-surgical dental or medical treatment have such broad potential. 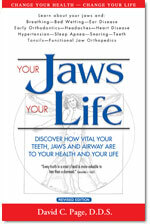 FJO oral devices and treatments can uniquely improve appearance and overall body health in ways traditional medical treatments cannot. FJO palatal expansion is about 80% effective in helping mouthbreathers to breathe through their nose regularly for the first time. This results in less colds, less respiratory infection, reduced nasal allergy and helps many cases of asthma. It is also about 80% effective in reducing or stopping bedwetting in children in just a few months. Many patients with middle and inner ear disorder suffer from dental problems and are helped when the dental problems are fixed. About one-third of children chronically have supposed ear infections, which can be reduced or eliminated altogether by FJO dental treatment. Oral devices can be effective to open airways for many patients with sleep apnea and reduce the need for throat surgeries.